It looks as though we better get ready for waves of blue across the footballing scene. Leagues throughout the European circuit have only just gotten underway, and hype for the coming season is well and truly at boiling point. We’ve already enjoyed more than our fair share of inspiring comebacks, shock results and incredible goals, so it’s fair to say that none of us can wait to see what the approaching weekend of matches will bring. With the return of football now all over our TV screens, the imminent arrival of a new FIFA game and the fact that we’re all still agonising over our Fantasy teams- football is absolutely everywhere right now. So it seems like the guys over at Umbro have got their timing absolutely spot on, because their brand new ‘Bluefish’ colour packs look set to ride the current wave of football hype (see what we did there?). If this release was part of a music festival, then it’s undeniable that the Medusae II Elite would be the headline act. Umbro first introduced us to the second iteration in the Medusae collection earlier in the year, and it’s fair to say that the new blue-black colourway stands in stark contrast to the original yellow and blue combination. But by toning things down a little, many players may well be more tempted by this smarter look. Featuring a responsive knit collar and a contoured heel, the Medusae II Elite offers a sense of stability that’s very hard to find in other boots. 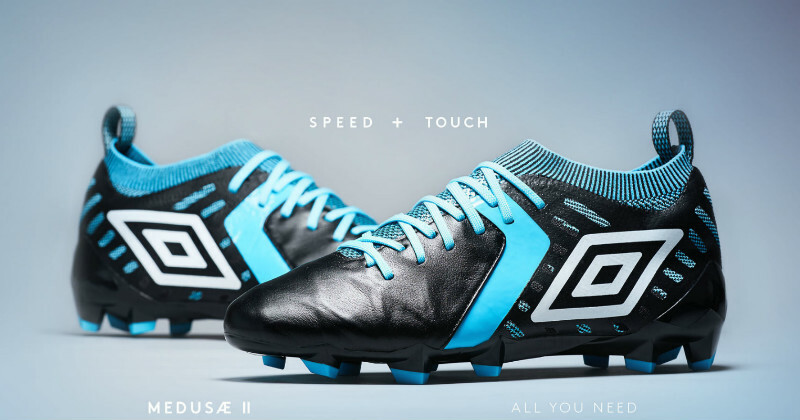 With a bespoke fit and a snugness that’s bound to enhance your game, it’s clear that Umbro intend these boots to be an awful lot more than a fashion statement. The extra grip and stability involved with the Medusae Elite II means that they’re perfect for enhancing your speed and agility, so you’ll be turning your way past defenders in no time at all. While the Medusae II has been given a smarter, more subdued look, the Velocita III is certainly the most colourful addition to the pack. Featuring an incredibly vibrant aqua aesthetic, the Velocita III certainly never fails to catch the eye. And as one of the more popular Umbro boots on the professional scene, we expect it won’t be long before it’s making waves across the top leagues in Europe. But it’s not all about the light blue and black colourway, because the Velocita III gives players some of the best football boot technology around. Incorporating a neoprene mesh sock for a close fit, a three-layered upper and a double ‘A’ frame for enhanced stability- these boots are all about boosting your multi-directional speed. Incredibly lightweight and flexible, it’s not hard to see why these babies are so popular in the professional game. The UX Accuro is much more subdued than the other two designs in the collection, but that doesn’t prevent it from being just as impressive. Opting for an all-black, shadowy appearance, Umbro have come up with an absolutely gorgeous football boot that stays true to the traditions of the Accuro series. It may be easy to say that Umbro have played it a little safe with this design, but the fact of the matter is you just can’t beat a smart pair of black football boots. With dashes of the light-blue that features so prominently on the Velocita III, the UX Accuro adds a certain sense of sophistication and professionalism to the ‘Bluefish’ collection. The new Accuro features a lightweight upper that provides a larger surface for players to strike the ball, while the adaptive fit means that you can start bagging some goals in ultimate comfort. There’s even a series of Touch Control pods to enhance your grip on the football, while the Poron Xrd strike area provides a level of pinpoint accuracy you can only dream of. In short, these might well be the smart shooting boots you’ve been looking for. We told you there was no need to be feeling blue! Even though summer may well be coming to an end and it’s been raining cats and dogs all week, the ‘Bluefish’ pack has certainly perked up our spirits! If you’re looking for the best deals on football boots, then browse the collection available at FOOTY.COM today. We compare prices between the biggest retailers on the internet, so that you can always find the best deal possible!